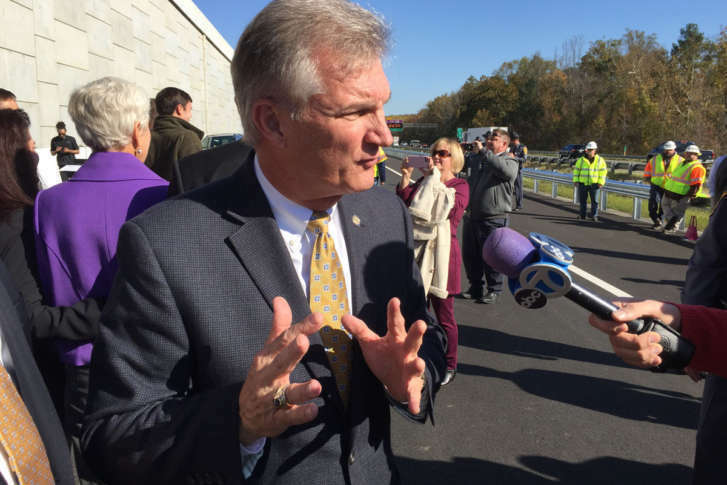 "This signifies the beginning of things to come," Virginia Transportation Secretary Aubrey Layne said after a ribbon-cutting news conference for the 95 Express Lanes extension. STAFFORD COUNTY, Va. — The single, reversible travel lane extending the 95 Express Lanes two miles farther south into Stafford County, Virginia, might seem like a humble addition, but state leaders believe it represents a puzzle piece that will lead to a prettier traffic picture. “This is another step toward extending the express lanes and providing more reliability and more dependable trips in this corridor,” Virginia Department of Transportation Commissioner Charlie Kilpatrick said after Tuesday’s ribbon cutting for the new lane. The 95 Express Lanes are available to single drivers who pay a toll or High Occupancy Vehicle (HOV-3) carpoolers. “The project that we built here and that we’re opening today will accommodate two southbound lanes in the future,” Kilpatrick said. “As part of the development of this project, we designed and graded the roadway, the road bed out so that when the express lanes are extended south of here, the second lane will be incorporated as part of that work,” Kilpatrick added. “This signifies the beginning of things to come,” Virginia Transportation Secretary Aubrey Layne said after the ribbon-cutting news conference. Layne said plans to extend the 95 Express Lanes an additional 10 miles to Route 17 in Fredericksburg are being finalized now, and that money for the project will come from state, federal and private partners. “That project will be delivered. We’re now working on the final details, and when they’re done, there will be an announcement. But I can assure you that that extension will happen,” Layne said. Closer to D.C., the Interstate 395 HOV-3 lanes north of the Capital Beltway will become an extension of the 95 Express Lanes in late 2019. Roadway capacity will expand from two to three reversible travel lanes. In other projects along the I-66 corridor, solo drivers will be able to pay tolls next month to use I-66 inside the Beltway during rush hours that currently are reserved for HOV-2 carpoolers. New round-the-clock I-66 toll lanes between the Beltway and Gainesville are expected to open in 2022. Every car that uses the toll lanes has to be equipped with either an E-ZPass transponder for payment or E-ZPass Flex switched to HOV mode that allows free passage for carpoolers.